Sun Valley cyclist Joshua Berry, 22, has ridden the ups-and-downs of injuries, changes of teams, and different disciplines throughout a career in two-wheeling that goes back to adolescence in BMX, cyclo-cross and road biking. He’s had his share of accomplishments but has also suffered through setbacks. There was a severe head-on collision with a truck three years ago while training in Oregon, and a premature end to his 2012 racing season for the Chipotle-First Solar Development Team when a chain rink sliced through a knee tendon. Saturday was a good day for Berry, a 2009 Wood River High graduate who has raced with the U.S. U-23 national road cycling team and is competing in 2013 for the French Continental team La Pomme Marseille. 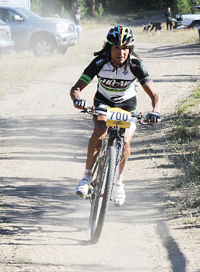 Berry (3.25:56) rode away with Pro Men’s title of the Galena Grinder Whit Henry Memorial 45-mile marathon mountain bike race on the Galena Lodge trails north of Ketchum in the Sawtooth National Recreation Area. The Galena Grinder was the third and final stop on the 2013 USA Cycling Professional Mountain Bike Ultra Endurance Tour (Pro UET). Setting a new course record, Berry prevailed by nearly 11 minutes over Sho-Air/Cannondale’s David “Tinker” Juarez, 52,of Whittier, Ca. (3.36:44)—the current Men’s Pro UET leader. Galena Grinder organizer Marc Driver said, “Josh is a local pro racer who has battled through injuries and has been trying to win this race for several years. He finally put it all together and set a new course record. I’m proud of him. Third place among Pro Men went to Michael Tobin, 50, of Boise (3.41:00). Community School grad Tobin is an adventure racer from Ketchum who set Baldy Hill Climb records and became an XTERRA world champion and Hall of Famer. Women’s marathon winner on the two-lap course measuring 22.5 miles per lap was 40-year-old Jana Repulski of Boise and the Broken Spoke Cycling team (4.17:05). Fourth among Grinder women last year, Repulski also placed fourth among Pro Women at the USA Cycling Marathon National Championships July 6 in Sun Valley. Second place Saturday at the Grinder went to Pro UET challenger Serena Gordon, 34, of Bend, Ore. (4.20:01). Compared to recent Grinders, Saturday’s Knobby Tire Series event had a relatively small field of 31 racers for the 45-mile marathon and 66 for the cross-country races that ranged in length from 10 to 22.5 miles. It was the 12th anniversary renewal of the current incarnation of the Grinder, a mountain bike race at 7,300-foot altitude that’s been held here for two decades. It was the third year that the Grinder has been a featured Pro UET Tour stop. The event is held in memory of Whit Henry, a 2001 Wood River High School graduate who died July 2, 2003 in an accident on U.S. 20 between Timmerman Hill and Fairfield. He became a passionate cyclist before his untimely death at 20. Men’s Open/Pro Cat. 1/2/3: 1—Joshua Berry of Coeur d’Alene 3.25:56. 2—David “Tinker” Juarez, 52, of Whittier, Ca. 3.36:44. 3—Michael Tobin, 50, of Boise 3.41:00. 8—Sam Young of Ketchum 4.05:23. 11—Matt Luhn of Ketchum 4.22:59. Women’s Open/Pro Cat. 1/2/3: 1—Jana Repulski of Boise 4.17:05. 2—Serena Gordon of Bend, Ore. 4.20:01. 3—Jennifer Tobin of Boise 4.40:58. Men Open/Pro. Cat. 1/2/3 Single Speed: 1—Sean Donovan of Boise 4.24:11. Men 30-39: 1—Mark Schafer of Boise 4.07:56. 4—Carter Ramsay of Ketchum 4.44:22. Men 40-49: 1—Kyle Rafford of Ketchum 4.17:07. 3—Jeff Ford of Hailey 5.13:27. Men 50-plus: 1—Tim Phillips of Eagle 4.08:43. 2—Chip Deffe of Hailey 5.25:56. 3—Herberth Corrales of Hailey 5.57:05. Pro/Open Cat. 1 Men: 1—Dave Harrison of Sun Valley 1.51:59. Pro/Open Cat. 1 Women: 1—Jena Greaser of Ketchum 2.12:51. 4—Simone Kastner of Hailey 2.34:26. Men Open Single Speed: 1—Chris Howell of Pocatello 2.10:52. 3—Will Raff of Hailey 2.14:56. 4—Don Shepler of Ketchum 2.17:18. Men Cat. 1 50-plus: 1—Jim Santa of Hailey 2.17:07. Men Cat. 1 40-49: 1—Matthew Shelton of Mill Valley, Ca. 2.04:09. Men Cat. 1 30-39: 1—Aaron Phillips of Salt Lake City, Utah 1.48:50. 2—Jedediah Young of Ketchum 2.17:36. Men Cat. 1 19-29: 1—John Reuter of Ketchum 1.51:26. 2—Ryan O’Hara of Ketchum 1.55:32. Men Cat. 2 50-plus: 1—Kris Thoreson of Sun Valley 1.46:13. 5—Scott Grill of Ketchum 1.58:17. 6—Michael Olenick of Hailey 2.07:08. 7—Andy Andrews of Hailey 2.08:42. 10—Chris Kastner of Hailey 2.25:50. Men Cat. 2 40-49: 1—Steve Price of Twin Falls 1.36:33. 3—Brad Mitchell of Hailey 1.47:56. Men Cat. 2 30-39: 1—Kelsey Backen of Eagle 1.39:32. 2—Zeban Stroebel-Haft of Ketchum 1.41:04. 3—David Vanderpool 1.49:13. 6—Ryan Frieder of Santa Fe, N.M. 2.18:40. Men Cat. 2 19-29: 1—Gus Pelican of Boise 1.43:44. Men Cat. 2 15-18: 1—Eli Kranefuss of Mill Valley, Ca. 1.40:49. Men Cat. 3 50-plus: 1—Greg Mondin of Boise 1.09:50. 2—Tom Praggastis of Sun Valley 1.10:11. 3—John Fields of Fairfield 1.29:05. Men Cat. 3 40-49: 1—Ellis Perkins of Twin Falls 59:15. Women Cat. 3 40-49: 1—Kimberly Poulson of Boise 1.17:15. Men Cat. 3 30-39: 1—Kevin Hanners of Filer 1.03:37. Women Cat. 3 30-39: 1—Carmen Finegan of Sun Valley 1.10:57. Women Cat. 3 19-29: 1—Lexi Praggastis of Sun Valley 1.06:17. Men Cat. 3 15-18: 1—Spencer Ferrer of Star 54:46. Men Cat. 3 13-14: 1—Dylan Fluckiger of Twin Falls 1.15:39. Men Cat. 3 10-and-under: 1—Adam Fluckiger of Twin Falls 1.28:23.